Imagine the world without music, that the only thing you could crank in your car was the air conditioning. Nobody could hum or sing. Movies would be almost unwatchable. There is nothing more comforting than a song. 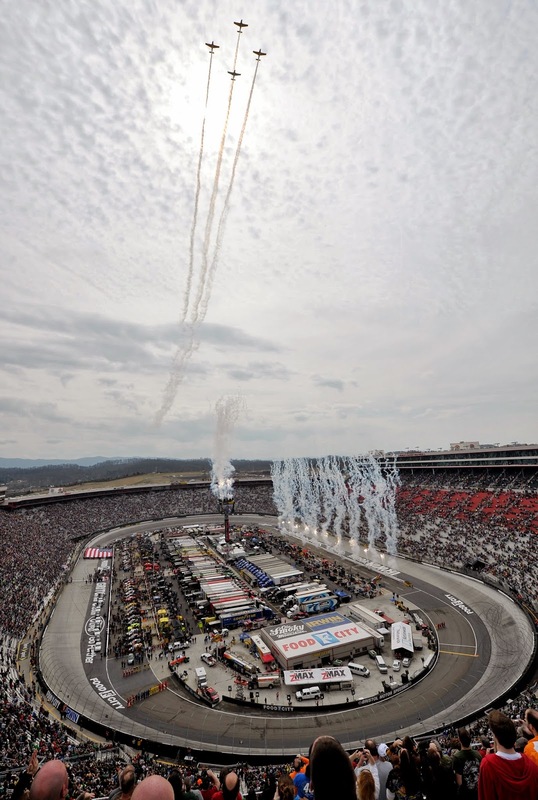 This weekend’s race is at Bristol Motor Speedway, the fish bowl of the NASCAR circuit. It’s known for fast cars and brutal wrecks. At the same time, it’s unique for another aspect; the track allows drivers to choose their introduction song. If that isn’t cool, then I don’t know what is. Music has a way of saying the words one can’t form. It’s the profession of love, pain and confusion when we sing off-key because we know how it feels. It’s the ideal escape. Recently, I bought The Outsiders by Eric Church. As many people know, I’m a huge country music fan; there’s nothing it can’t do for me. Alabama, Garth Brooks and Alan Jackson can influence my mood for the better. One song on Church's CD stands out, not just for its artistry, but for its subject matter —racing. “Talladega” is a ballad about a young man’s road trip to Talladega Superspeedway with his best friends. They participate in the infield activities and make memories during the race weekend. As if I needed another reason to love country music. Melodies and lyrics connect us with moments, people and settings. Songs provide a medium to express the emotions we struggle to handle. Music gives us something to crank when we want to get rowdy. There isn't much that music can’t do. This weekend is a trip to Bristol, the short track heard around the world. I discuss qualifying, NASCAR’s slacking heartthrob and more in this edition of Five Questions. Put in your earbuds, and read on. How will NASCAR’s changes affect qualifying sessions? NASCAR announced their new adjustments to the qualifying format. First, no cool down laps will be allowed. Since we’re heading to Bristol this week, it’s a pretty smart move. The other addition? Drivers are allowed to cool off their engines on pit road. Two crew members are allowed to jump the wall and distribute cold air through the roof flaps. These changes will improve the qualifying procedure greatly, and all it took was a bit of patience. What’s wrong with last year’s winner, Kasey Kahne? The driver of the No. 5 won this race last year after multiple runner-up finishes and consistent runs. So far, this season has not begun that way for Kahne. Of all the Hendrick Motorsports cars, he’s behind. Really behind. Losing car chief, Keith Rodden, to Jamie McMurray’s crew over at Chip Ganassi Racing was difficult for him and the rest of the team. Aside from that, the potential is there and Kahne normally takes a while to warm up. Here’s hoping he can do that and earn some victories along the way. Kevin Harvick and the SHR Band? By far, Harvick is the strongest of the Stewart-Haas Racing camp. He’s already won, and it’s possible he could’ve gotten another win if it weren’t for left front hub issues. Like Kahne, the rest of the group can’t get going. Owner Tony Stewart is still recuperating from his leg injury. Kurt Busch is trying to mesh with a brand new set of people, and Danica Patrick is really, really lost. With Harvick as the front man, the rest of SHR needs to step it up before they’re backup singers for good. After the first three races, which rookie is looking the strongest? All drivers were rookies at one time and they did questionable things, right? Well, it’s easy to see which rookie is the fearless one of the group. Austin Dillon put his No. 3 on the pole for the Daytona 500. During the race, he wasn’t afraid to bump and bang his way through the pack. That attitude is what makes him a great fit for carrying on Dale Earnhardt Sr.'s legacy. His early start has people talking, and it’s easy to see the other rookies have a lot of catching up to do. If they don’t, NASCAR could conceivably hand over the Rookie of the Year award now. I think Larson will give Austin a run for his money for Rookie of the year! I'm not quite sure it's fair to say Danica Patrick is "really, really lost." She was caught up in a wreck at the Daytona 500 (not of her own doing), so that's bad luck. At Phoenix, she was involved in two wrecks, the second where she spun out by herself. The first wreck at least could be more bad luck; second could have stemmed from a damaged racecar. At Las Vegas, she finished 21st, which may not sound great at first, but in context she was the highest-finishing SHR car. It seems to me she's started off the year with bad luck (including wrecking during practice today at Bristol), but I don't think that's the same as being "lost."